On Fox News Sunday, United States national security advisor John Bolton brought up the Libya model as a template for the denuclearization of North Korea. However, Trump did assure North Korean chairman Kim Jong-un that he’d remain in power after denuclearization. There was some talk about the Libyan model last week, and you know, as the President made clear, this will only end like the Libyan model ended if Kim Jong Un doesn’t make a deal. History tells a tale. After Libyan leader Moammar Gaddafi gave up Libya’s nuclear weapons program, he was eventually deposed by NATO bombing in support of rebels who brutally murdered Gaddafi in cold blood. 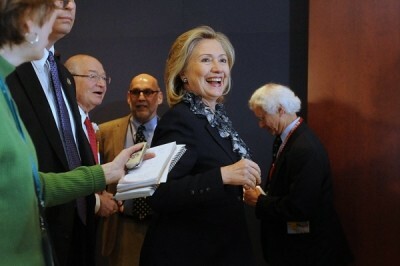 Hillary Clinton gleefully cackled about it afterwards on CBS News. What kind of dunderhead would Kim have to be not to realize the behind-the-curtain machinations Washington has planned for him and his government. The US simply should not be believed or trusted. But there seems to be an apparent wrench in the works of Washington’s scheming. Kim, after all, has a nuclear bomb. It makes one wonder: what do Donald Trump and the US military establishment not understand about nuclear deterrence? There are no winners in a nuclear war. All the blather about a Libya model merely reinforces the correctness of the North Korean decision and the necessity to develop a nuclear deterrence. It must be emphasized that — despite wild proclamations from Washington  — what North Korea possess is a nuclear deterrence and not a nuclear threat. Obviously, to initiate a nuclear attack would be sheer folly and a suicidal act for Kim Jong-un and his government. However, North Korea is on record as asserting a no-first-use policy for nukes. This is a rational stance. Contrariwise, the US does not reject its first use of nukes. Thus, the US nukes exist as other than a deterrence factor. Is the US an irrational actor? The bigwigs in the Trump administration are not dunderheads either. There is a method to their madness — a desired outcome. The US, despite administration declamations to the contrary, is quite aware that North Korea would not start a nuclear war. The North Koreans are known to be rational. Yet the strategizing of the military-industrial complex is also based in rationality when its capitalistic motivations are considered. When it comes to warmongering, the greater the number of enemies the US is faced with, the more opportunities for weapons deals to replenish homeland armories and supply fearful allied countries. Moreover, there are the opportunities created for morally challenged investors to seek profit from war. The military-industrial complex’s lust for war profiteering motivates it to maintain a hostile posture to designated enemies like North Korea. This is rational in the pecuniary sense. It is rational for the military-industrial complex to assume a hostile posture to Iran. It is logical to support war crimes by the Jewish State against the civilian population of Gaza and also to support the siege of Gaza in hopes of fomenting a violent uprising. It’s rational to keep Syria in conflagration. It is even rational to poke the Russian bear and prod the Chinese dragon. The more formidable the designated enemy, the greater the potential for evoking fear among the domestic populations and crank over the wheels of the military-industrial ever more. In this manner arms sales are stimulated, share prices for armaments are sent rising, and thus it happens that the undiplomatic bombast and war crimes committed by military industrialists are rewarded with ensanguined lucre. Nonetheless, all the money in the world means nothing come a nuclear winter.